I’m always one for jumping into things immediately, both feet first. So, after making spreadsheets about chicken prices in supermarkets at one o’clock in the morning and devising a list of chicken recipes I wanted to try out, I decided to make my first chicken recipe on Monday evening. I’ve been feeling a bit under the weather for a good few days now, so I decided to make Jamie Oliver’s Feel Good Chicken Broth from Jamie’s Dinners. At first this was partly because I thought it would be one of the cheaper recipes, because it’s basically chicken, boiled with carrots, celery, bacon and rosemary. And it would have been, except Jamie expressly lists an organic, free range chicken in the ingredients. Damn. I decided to add another rule to my list since yesterday, but I’m perfectly willing for this to be optional, money permitting. The idea is that if the recipe expressly calls for a certain kind of chicken – corn-fed, organic, whatever – I’ll hunt that out. That way, I can judge the recipe fairly. After flicking through Jamie’s Dinners, it seems as though Jamie is a chicken snob of the highest order – who would have guessed, right? – as every recipe calls for an organic, free range chook. Free range I get, but organic? 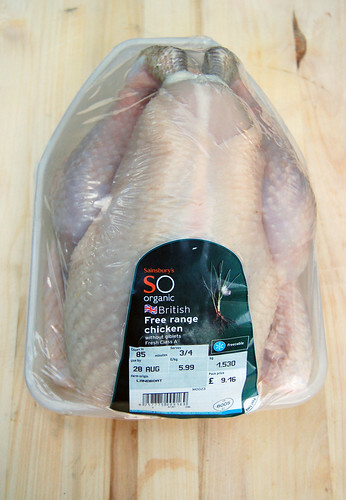 Organic chickens are significantly higher in price (I know, I did the spread sheet at one o’clock in the morning) than any other kind of chicken, and I have to be honest, I don’t know whether that makes any difference to the chicken or the taste. So my cheap mid-week dinner (all right, start of week dinner) turned out to be really pricey. Ah, would have been so cheap if I’d been able to get an abused chicken. Oh well. To be honest, I’ve always wanted to try something like this, to see how good good ingredients can really be if they’re cooked simply. So, I popped into Sainsbury’s and picked everything up before borrowing my dad’s Nikon D50 to take photos. Only, I’d left it a little too late in the evening, and with the light rapidly fading I was forced to take the final photos today. As far as ease of method goes, this is a pretty simple recipe. You simply simmer the chicken with two roughly chopped carrots, two sticks of celery and 1 rasher of smoked bacon (I used two, because I felt like a dip asking for one rasher at the butcher’s counter) for one hour and five minutes, then add three sprigs of rosemary in for another ten minutes, ensuring you skim the white residue off the top every now and then. So I was very good and followed the recipe exactly, until I got to the end and wound up with lots of vaguely chickeny flavoured water. So I strained it like Jamie said, but instead of serving as it was with salt, I put it back in the pan and simmered it until it tasted stronger. So, today, I got the chicken and stock out and did a test run for tonight to see what the soup would taste like, and to take some pictures before I had to give the camera back. 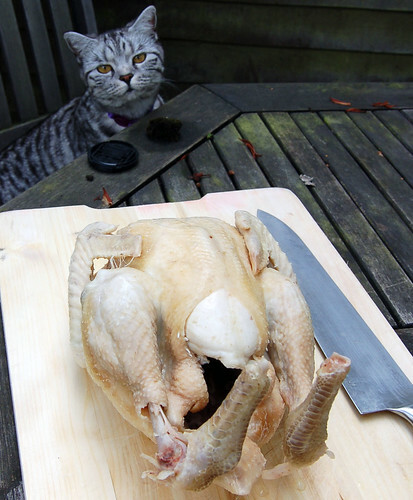 As you can see, Saffy was a fan of chicken au natural. I found it to be rather tough. Maybe I overboiled it, or maybe as this is a recipe for chicken soup and not poached chicken, the point is that the stock is flavourful and not that the flesh is tender. After all my boiling down, I ended up with about 1.2 litres of chicken stock, which didn’t quite set to jelly. After I’d removed all the chicken and flavourings yesterday, including the rosemary, the taste of rosemary was there, but very faint. Today, it was barely there at all. I guess reducing the stock damaged the taste of the rosemary, so maybe it should only be added ten minutes before you intend to stop cooking if you’re going to reduce it like I did. So, in order to bring the taste of rosemary back, I added a rosemary garnish, just like the photo in the book. 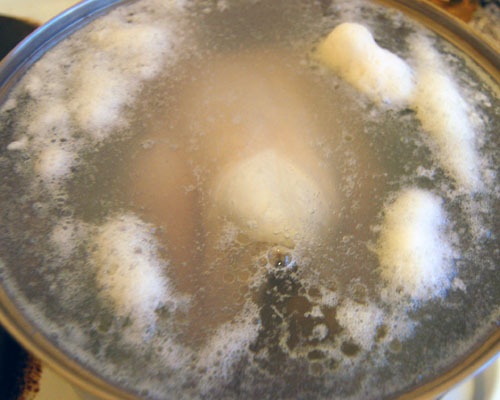 The end soup is rather greasy, thanks to all the fat given off by the chicken in the cooking process. 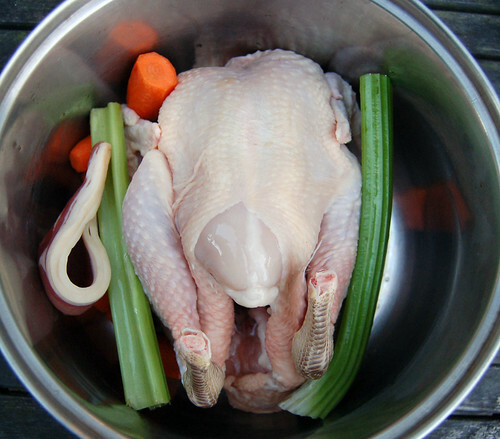 I had to add a tonne of salt, but when I did, the chicken stock was really delicious and flavourful. The meat, as I said, was slightly tough. I didn’t cook it again after yesterday, just put the cold pieces in and covered with hot stock, so it can’t be down to cooking it twice. Ah, well. All in all, a tasty, simple chicken soup. But that’s all – chicken soup. 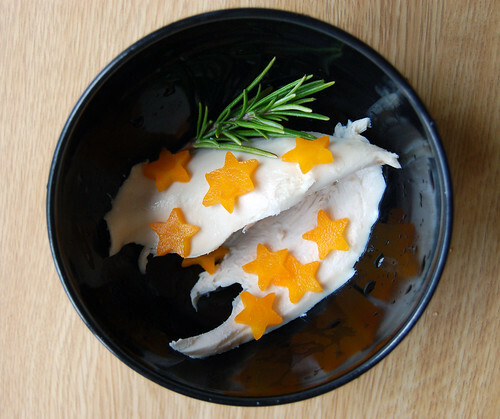 You can’t really get around that this is a simple dish – I would love someone to cook this for me when I’m sick. But whether it was worth a tenner, I’m not so sure. M gave it 6, saying that the rosemary garnish really packed in some extra flavour. But, it’s soup. Very nice soup, but soup. I gave it 6.5, for pretty much the same reasons. It does feel really luxurious to be able to make soup with a whole chicken just to get some tasty stock, and I’m glad I did it. But there’s no way this is going to be the highlight of the challenge. I hope! I’d make it again, but I don’t know if it’s worth making it with an organic chicken. I’ll have the breadmaker on tomorrow to try tiger bread, so I’ll try the chicken buns. Can I suggest Nigellas recipe for chicken broth? It always goes really set and jelly like with me, helps if you add in a couple of chicken thighs to the pot. 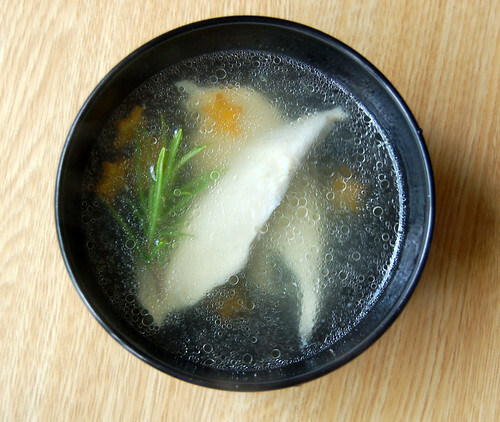 Best ever recipe, proper jewish penicillin! I’ll definitely check that out – thanks for recommending it! I’ve just made her recipe for chicken stock from How to Eat with the leftover chicken bones, and it was ace, so I’ll definitely give that a whirl!